Many of you readers are perhaps not aware that there is a manufactory here for the purpose of making paper pulp from wood. But such is the case and it is one more evidence of the energy and enterprise of Hanover capitalists. It is located about 3 � miles south of the village on Apple River. The building is a substantial frame structure a story and a half high. The machinery which is on the first floor consists of a circular saw, two emery wheels 4 � feet in diameter and 4 inches thick, a cylinder, felt and roller the same as is used in paper mills. The machinery is driven by two water wheels one of fifty and one of twenty horsepower, the latter is used only during back water when more power is needed. They can use various kinds of wood but that used at present is white poplar. It works well and when the water is clear, makes a nice white pulp which is used in making white paper and is consequently of most value. The process of making it is as follows: the logs are first sawed into pieces of about 10 inches in length by means of a circular saw, the bark is taken off by hand and the wood split to about the size of fine stovewood. The two emery wheels spoken of above are used for grating the wood and when in operation they run at the rate of 500 revolutions in a minute. They are encased in a metal covering except a small opening at each side. At each of these openings there is a metal box or slide which is filled with those small pieces of wood, the side of the sticks coming in contact with the wheel; at the outer end of these slides there is a self adjusting pressure which by means of weights and pulleys keeps the wood firmly pressed to the revolving wheel. A stream of water from a tank upstairs is constantly falling on the wood which when ground up makes a kind of creamy liquid. This liquid passed down through a screen into a vat, the screen separating all coarse fibers and foreign matter. In the vat there is a revolving wire cylinder (open at both ends) which carries up the pulp until it comes in contact with the traveling felt to which it readily adheres. This felt passes under a wooden roller which in its' turn claims the passing pulp, forming a kind of gum, as it were. When this accumulates to the desired thickness it is taken from the roller and cut in sheets of convenient size for packing. It requires nine hands to run the mill and will average about two and half tons of pulp from the roller daily which when dried loses about 60 per cent in weight making just a ton of dry pulp which is sold to paper mills at from three to three and a half cents per pound according to quality. Your correspondent is indebted to Mr. James White, the gentlemanly superintendent, through whose courtesy the above particulars were obtained. Gentlemanly James White had arrived on the scene thirty years previous to this account of 1876. Although not the first to recognize the importance of the waterpower of Apple River it was he who was responsible in large part of development and continuing expansion of the manufacturing and industries which were Hanover. "Industrial Hanover" does not seem to describe the community. The place gives you no such impression as it has today, the quiet character of its setting. It's unlikely that it ever had the rough, brawling attitude of a Pittsburgh or Gary even at the zenith of its industrial history which has been so different than any of the other of our near neighbors. This essay, however, is not a recounting of Hanover's history which is early and interesting and connected with that of Carroll county not only because of its proximity to us or because Capt. James Craig, one of its early entrepreneurs, had business interests in western Carroll and who as a representative introduced the bill in the state house which formed our county out of Jo Daviess in 1839. It is, rather, in this case, a background of just one of the aspects of the place due to the fact that the foregoing description of the pulp mill was found in the Carroll County Gazette, Lanark, in June, 1876 which gave the brief sketch of an industry little known, and perhaps unique in northwestern Illinois, if not all of Illinois. We would hardly picture a paper pulp mill in the rural, scenic beauty of Jo Daviess county. There were no vast acres of high timbers echoing to the ax of brawling lumberjacks. The place is removed from any large supportive complex we might expect would be necessary to such processes. But it was just this site on the ready natural waterpower of Apple River which was the reason for its location. A short background is necessary to its commencement. The present site of Hanover first came to the attention of "white men" in 1827. Within a few months James Craig took the claim of the site and prepared to build a mill which was completed by 1842 to begin the manufacturing nature of the town, then named Wapello. Just six short weeks after this the mill burned, seriously affecting the finances of Craig and the community. The business lay idle for three years until the advent of James White. White was not a newcomer to the area. As a young man he had arrived with his family to Savanna in 1837 and two years later set himself up in merchandising. Within four years he had expanded operations to Elizabeth with M. B. Pierce, a venerable Carroll name, conduction the business. White assumed the charge of this in 1843, moving to Elizabeth that year, the meanwhile having married Almira Jenks of Savanna. The spring of 1845 he bought the waterpower and two hundred acres on Hanover's town site to build a dam, sawmill and a large flour mill, which, too, was nearly consumed by fire in 1848 but which disaster was thwarted by the dedicated attentions of the townspeople who were rewarded for their efforts by the management with a bottle of peach brandy for every man and a new dress for each lady firefighter. Several other such reversals in the form of flood, collapse and the state of the economy were to visit these enterprises over the years. The partial collapse of the mill in 1857 and then the following year, the coming of the chinch bug which had its way with the wheat crop so plentifully supplying local mills up to then, were responsible for a change in the direction of manufacturing history. Consultations in Galena advised the Hanover merchants to use the waterpower to drive mechanical looms to manufacture woolen cloth. A biography of White remarks that his father for a number of years had been involved in the manufacture of "card clothing." That background may have been inspiration to James White, who it was suggested, could then peddle the woolen cloth by wagon around the countryside. An 1889 biography remarked, "The chief difficulty was to secure the assistance of moneyed men but after great persistence the concern was set on its feet." Eventual success was the result of adaptation and effort. The Hanover Woolen Mill was organized in 1864 to continue until 1949 when other interests took over the property. "It is surprising to find so far from railroads and outer world a busy little village nestled among the hills, turning out a large quantity of fine cloths such as a few years ago were known only as 'English Cassimeres,'" says the 1878 history. And just as surprising to have found there a paper pulp mill nearby. It was founded by James White, its general manager, with R. H. McClellan as president. It originated in 1875 after a major reorganization, apparently, of the woolen works which was increasing its capital stock. Located about four miles south of Hanover at what was known as Petersburg in section 34, Hanover township, Jo Daviess, some reference to it may be seen by going about a mile and a half north of the Carroll county line on Rt. 84 to where a large new bridge crosses Apple River flowing immediately parallel on the left. On the right is a very high, steep terraced slope. This is the "Petersburg" bridge. Cross it. You then will pass a small cemetery on the left; the Lost Mound. The road twists and turns west a little and north; enjoy. On the left you'll see a small portion of the buildings of the Savanna Army Depot while on the right the odd hiccups of nature which indicate that the hilly terrain of the lead region is nearing. Turn right at the first road a few miles up and you'll come out at Whistling Wings, another of Hanover's industries. Otherwise it's a back road which if you're lucky, comes out at Hanover. Just where the mill was along this way is not clear but we assume back near the bridge. Even its eventual demise seems lost in history but we know it was run by waterpower, controlled by a ten foot high dam, two hundred feet long with a "head and fall of eleven feet." It was begun with a capital of $16,000 in '76, using cottonwood, aspen or poplar "in a mixture of � to � parts straw and ragpaper." Three cords of wood were used each day in the process. History does not tell us why this venture was begun, if the supply of wood was local or shipped, perhaps, in lografts down the Mississippi which Apple River seeks in its meanders to find a few miles away or much else about it. It was, however, a unique contribution to history and resulted from efforts of its proprietors who obviously hadn't heard the slogan, "We can't. It's never been done here before!" 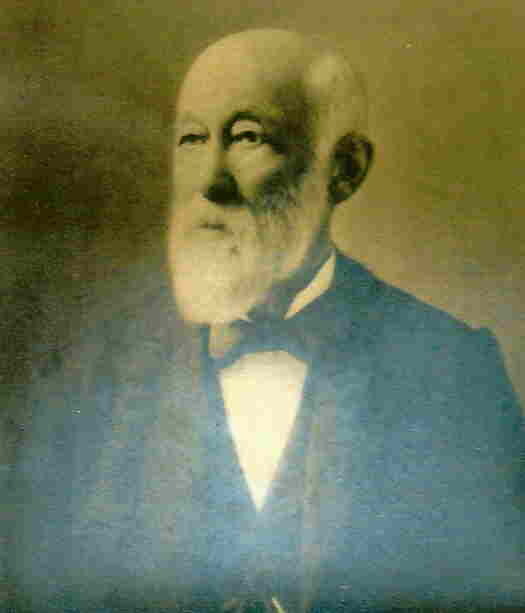 James White, like many others, served in many capacities in order to make things go; postmaster, giving the town, in fact, its present name in recognition of his native place in New Hampshire; land for public buildings and served as its first mayor after village incorporation in 1877. He directed the progress of various enterprises until retiring in 1904 and died at ninety one in 1909. He might definitely be said, as one account states, as being "held in high esteem as a representative of its leading element." From such elements, will to adapt to the times and daring to risk, we have derived jogs, livelihood and ways of life to help the economy of the places we live. Thanks to Michael John Skoworn Jr., [email protected], for these photos. NOTE: The present site of Hanover was a Sac and Fox Indian village when white settlers came to farm the area in 1828. A natural drop in the Apple River made the location ideal as a dam and mill site, the first of which was built in 1829 by James Craig. The settlement was initially known as "Craigsville," but in 1838 Craig laid out and platted the streets in the village and renamed the community Wapello after the chief of the Indian village. In 1849 the name was again changed, this time to Hanover. The village became incorporated in 1877. In 1863 the Hanover Woolen Mill was started, and in 1929 the organization built the large building now standing beside Crescent Falls Dam. The woolen mill operated until 1949. In 1965 the building was reopened as the Valves and Control Plant Number Two, by the Dole Valve Company, Eaton Corporation. It is currently run by Invensys, Hanover's largest employer.